1. Soak 8 bamboo skewers in water for 30 minutes. 2. Thread skewers alternating vegetables and chicken cubes. 3. Combine all marinade ingredients and pour into glass 9 X 13 glass dish. 4. 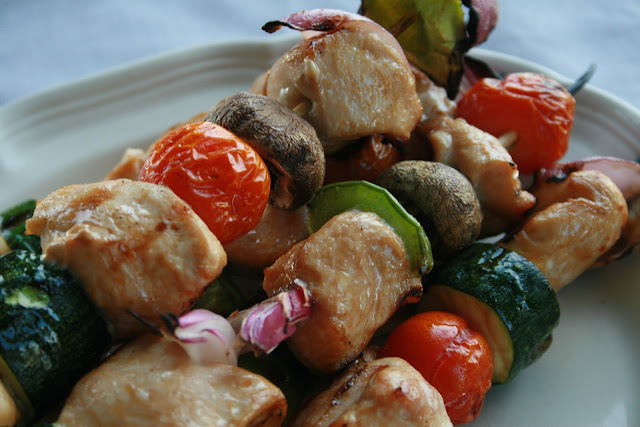 Add chicken and vegetable skewers to marinade. 5. Let marinate for 4 to 6 hours. 6. Grill on medium heat 6 to 7 minutes per side or until largest piece of chicken is no longer pink. This is one of my personal favorite grilled chicken dish. I love the blistered sweet cherry tomatoes and the slightly charred vegetables. The marinade works beautifully with the chicken and vegetables. This is and elegant dish that cooks quick.